John Deere has updated its crossover utility vehicle line with the addition of the Gator XUV560 and XUV560 S4. John Deere has updated its crossover utility vehicle line with the addition of the Gator XUV560 and XUV560 S4. The mid-size model is designed for grounds maintenance crews, landscapers, government facility managers and others seeking a versatile 4×4 utility vehicle. The line features an ergonomic operator station, quiet V-twin engine, independent four-wheel suspension, four-wheel drive and availability of more than 75 attachments. Go here for more information. The vehicles are designed for all-day comfort and productivity with car-like convenience, according to the manufacturer. The models offer easy entry and exit through an occupant protective structure. Safety is a top requirement, with three point seat belts and side grab handles. Both models offer sealed under-hood storage. They feature a large, one-piece cargo box made of material that eliminates rust and dents and reduces noise. The tailgate features truck-like performance. It only requires one hand for operation and can be opened or removed for easy cleanout or to carry longer items. Both models come standard with four-wheel independent suspension, providing a smooth ride over challenging terrain and good handling through tough corners. A 34.8-cubic-inch, V-twin gasoline engine powers the Gator models. The carburetor is tuned for rapid throttle response, reliable cold-weather starting, smooth mid-range power delivery and quiet idling. The models feature swift acceleration with a top speed of 28 mph to quickly get from job to job. Available in a two-seat or four-seat model, the XUV560 can seat a single passenger or a crew. Optional add-ons for the cargo box include a rail system, power lift, wall extensions and a spare tire rack. Choose from 75 attachment options for the vehicle. Attachments cover lighting, tire upgrades, racks and guards and other options. 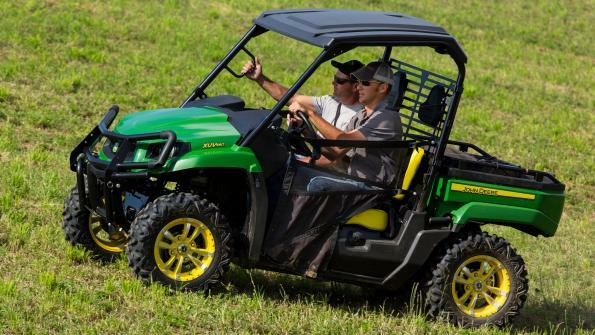 The Gator XUV560 and XUV560 S4 utility vehicles are currently available at your local John Deere dealer. Go here for more information.